Paul Wilkinson has revealed some of the plans that he believes can help take Boston Town to the next level - both on and off the pitch. The new Poachers director looks set to take over from club chairman Mick Vines in the foreseeable future. * He has already raised £30,000 in sponsorship from a team of ‘wonderful’ backers. * He wants to install a 3G pitch at Tatttershall Road. * Work will start on a raised viewing platform for directors. * DWB Timber Engineering have extended their sponsorship of the stadium. * He wants to unify the club’s junior and senior teams under one banner. * The function room will be renovated as the venue bids to host more private parties and wedding receptions. “Lots of small steps are happening. Hopefully things will soon start to move faster,” Wilkinson said. “It’s not been the best-kept secret that I’m hoping to take over from Mick Vines as chairman of Boston Town, with his blessing. Wilkinson’s involvement in Town is something of a labour of love. He has been a supporter for many years and he is hoping to help produce a winning side to make one club director very proud. “My father-in-law is John Nuttell, who has been involved with the club since day dot,” he said. However, Wilkinson knows that the Poachers won’t win anything without graft. “I believe in working hard,” Wilkinson continued. “I’ve had a few businesses and they all seem to have been successful. “I believe that’s down to hard work. If I see someone working for me out there digging it makes me want to pick up a spade and try to dig faster than them. “I’m not your traditional shirt and tie chairman. Wilkinson has already named a weekly budget for next season which he believes can make the Poachers among the title favourites in the United Counties League Premier Division. He said: “We’ve set a budget for next year that we think will make us competitive. The man in the dug-out is newly-appointed Dennis Greene. 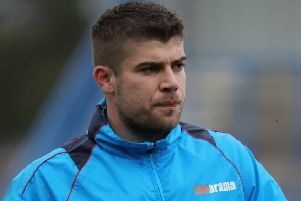 The former Boston United manager may divide opinion, certainly at the Jakemans Stadium, but Wilkinson believes Town have got the right man for the job. “Dennis is Dennis,” the new director continued. “He has his lovers and his haters. But I think he’ll do well. “He has excellent contacts and his teams play exciting football. And Wilkinson also had this message for the people of Boston: “Why not come down and just enjoy some football? “I believe in looking forward and not back. “I want us to win the league. I want us to win a couple of promotions if we can. “If it happens next season then that’s great.